The label for this fossil says it is a Paradoxides pinus trilobite from the Paleozoic Era. I would guess it is some sort of Paradoxides trilobite from the Cambrian Period found in Morocco. If I recall this fossil is pretty large, maybe the size of dinner plate. 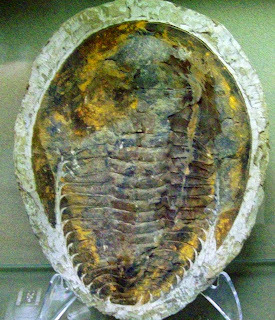 This fossil is on display at the geology department at Indiana University Southeast (IUS) of New Albany, Indiana as of August 2013.